You’re active on social media and the proud owner of more than a few YouTube videos, but have you begun to explore social video yet? The production and use of social video – very short clips of video or stop-motion graphics distributed via major social networks like Instagram or Twitter – took off quickly over 2013 and is now beginning to factor more prominently in social marketing strategies for student recruitment. There are two major social video platforms in the market today, each of which is owned by a social media giant. The first, Vine, began life as a tech start-up in June 2012 and was quickly acquired by Twitter in October of that year. The second, Instagram, has a longer history. It originally launched in October 2010 as a photo-sharing service, and was acquired by Facebook in September 2012, and added new features to support video sharing in June 2013. Users can now share six-second videos on Vine, and clips of up to fifteen seconds via Instagram. TechCrunch, a leading blog for the technology sector, provides a handy summary of features for each service in the table below. The other key thing to remember about social video is that these are mobile services, based around the booming use of mobile devices and reflecting emerging behaviours for online search, entertainment, and content sharing on mobile platforms. The research firm GlobalWebIndex pegs Vine as the fastest-growing mobile app of 2013, with Instagram’s hybrid video-photo service not far behind. The firm’s global survey estimates that Vine’s user base grew by just over 400% during the year, whereas Instagram usage jumped by an estimated 130% in 2013. As the graphic below illustrates, these growth rates put both services in some impressive company, including some of the world’s largest tech brands. 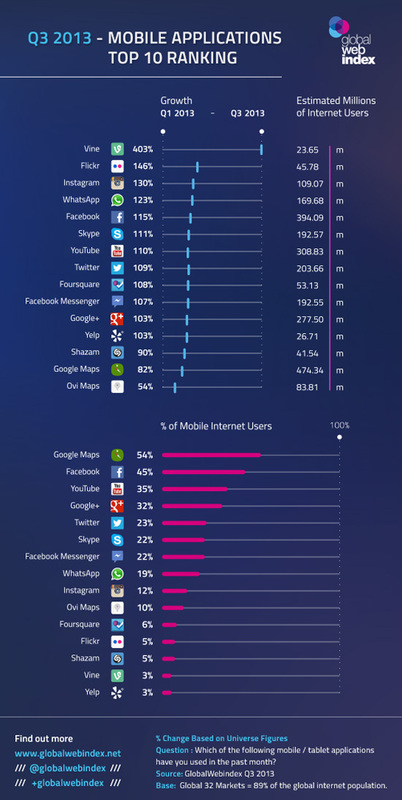 As the graphic also shows, neither Vine nor Instagram yet has the same leadership position in terms of overall market penetration. GlobalWebIndex estimates that roughly 3% of mobile users are also Vine users, and that Instagram – both photo and video sharing – is used by 12% of mobile users worldwide. As is the case for all new forms of communication and sharing, we’re all still learning how to use social video, particularly for any specific applications such as student recruitment. Many of the best practices that apply to social media certainly apply here – listen well, develop a distinctive voice, tell a good story, offer valuable content, etc. – and we’ve added a few additional tips and examples specifically for social video below. Hashtags have become an important way of categorising and filtering traffic on major platforms like Twitter, and they are especially useful in tracking topics that are “trending” – that is, topics that are drawing high traffic volumes locally, regionally, nationally, or internationally. When you think about how social video fits into your overall social media strategy – or your broader recruitment strategies for that matter – consider its unique strengths first and foremost: short video clips are a way to drive student or prospect engagement by creating a window into your school or institution, your community, and the student experience you offer. Along this line, some of the ways in which educators and recruiters are already using social video include creating micro campus tours, showing fun or unusual examples of local weather on campus, sharing student experiences, or capturing an important event. The “learning by doing” ethic is alive and well in social media. So take hold of some the important points we have outlined above and start experimenting with social video in your outreach to students and prospects. If you’re already active on social video channels, please feel free to post links to your favourite clips in the comments below. This entry was posted in Africa, Asia, Australia/Oceania, Europe, Marketing, Middle East, Most Popular, North America, Regions, South & Central America, Technology, Youth Trends and tagged international students, prep schools with international students, language schools, high schools abroad, postgraduate student recruitment.